When we think about Metals and Mining Industry, the first few things that we visualize in our mind are large trucks, big mines, heavy machinery combined with boilers, furnaces, and men in heavy protective gears. In contrast to this, the imagery of IT industry seems very sophisticated - AC rooms, well-dressed, employees sitting in front of shiny screens, and working. The relationship of IT and Mining industry is not made in heaven for sure. There are companies dedicatedly working to bring these two opposites into a strong bonding that is mutually beneficial and long lasting. The advancement in the IT industry, particularly in the area of Cloud, Wireless technology, Internet of Things and low power devices has enabled IT industry to provide services and products to Mining industry. These are aimed at optimizing productivity, minimizing the damage of assets, creating a safer work environment, and reducing and mitigating risks. These technological solution providers have enabled the Mining companies to remain viable by furnishing products such as ERP focused on workforce management which overcomes the challenges faced by Mining companies in terms of training and managing an effective work force. But these solutions are not limited to front office management. For an effective mining sequence, it is important to have an action plan before drilling holes or excavating rocks. The software vendors have designed software to design, analyze, load and time underground long hole blasts. In our selection, we looked at vendor’s capability to provide the technology solutions to Mining Industry, keeping a strong focus on how they address their customer’s occupational health, safety and environmental concerns. A distinguished panel of CEOs, CIOs, CMOs, VCs, analysts, and the CIO Review editorial board has selected top players from over three hundred companies. 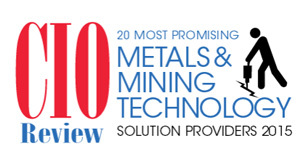 We present to you CIOReview’s Most Promising Metals and Mining Technology Solutions Providers. AssetPoint Provider of Computerized Maintenance Management Software /Enterprise Asset Management software (CMMS / EAM) solutions for companies. Carlson Offers the complete suite of solutions, across the disciplines of data collection, surveying, engineering design and drafting, mine planning and modeling, construction estimation and machine control. Centric Mining Systems Centric is the enterprise solutions software of choice for mining operations around the globe. Datamine Provider of mining software technology and services that are required to plan, manage and optimise mining operations. InEight Provider of technology solutions for the construction and engineering industry, offering a full suite of data visualization tools. Intelex Intelex offers a library of software applications that enable you to capture, track and report on essential corporate data. INX Software INX Software provides a wide-ranging view of the workforce and powerful tools for managing logistics, safety, competency, compliance, and procedures. Maptek Provider of innovative software, hardware and services for global mining industry. Minemax Covers the whole spectrum of strategic and operational mine planning,to achieve production requirements, maximize resource utilization, and optimize business value. MineSight MineSight is a comprehensive modeling and mine planning platform, delivering integrated solutions for exploration, modeling, design, scheduling, and operation. MISOM Technologies Miscom is an integrated information technology and mine operations product design firm. Modular Mining Systems Provides open pit and underground mining customers worldwide with field-proven products that enhance productivity, safety and equipment availability and utilization. Motion Metrics Specialized in developing advanced monitoring solutions designed to improve safety, efficiency, and productivity in mining. Mtell Provider of software solutions for managing the health of industrial equipment. Optym Optym develops advanced analytical solutions for the transportation and logistics industry Trucking, Airlines, Business Intelligence, Simulation, Analytics,and Mining. Promine Robust mine planning software for easy and successful mining operations. Rajant Corporation Rajant's Wireless solutions provide networks for Military, Mining, Oil & Gas, Homeland Security, First Responders, Telecommunications Service Providers and Public Safety. Scanimetrics Providing wireless sensing products and solutions, which increase productivity,lower operating costs, reduce risk, and optimize asset management. Threedify Provider of mining software solutions for 3D geological modelling, mine planning, design and scheduling, as well as open pit mine or underground stope optimization. WipWare Designs and manufactures industry leading photoanalysis software and hardware that offers real-time analysis of materials in the field, laboratory, on-line production settings for underground and surface mining, quarries, aggregate production, forestry, and coal industries.